New England Bites has been going to Lickety Splits for years, but has just now gotten around to officially reviewing them. 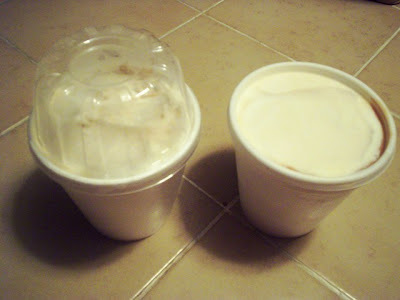 They have, in our opinion, one of the best peanut butter soft serve ice creams in the area, and with a buy one get one coupon, we were in the mood to bring home a couple of pints of the stuff. We pulled into the newly-paved parking area at about 7:15 p.m.
Lickety Splits is a Westport staple, and it's unfortunate that the restaurant version on Route 177 didn't work out. 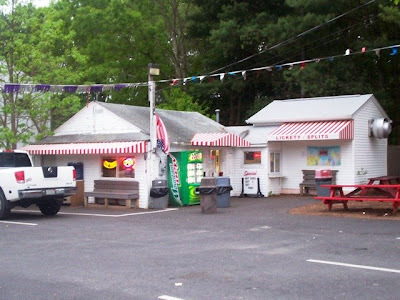 However, we still have the original ice cream stand on Route 6. Now, the coupon that Mom had cut out of the paper was a buy one, get one free - but it didn't have a limit! When I asked the gentleman (who I think was the owner) if I could get two pints with the coupon, he said yes. As I stood in line waiting for my two pints of peanut butter ($4.59 each), I noticed a sign which informed customers that, due to hard economic times, the staff had to be shortened. In other words, please be patient while they get your order. How unfortunate! In our opinion, perhaps the coupons should be more specific. You can't be giving away the store, especially during a time like this. With tax, my total came to $4.82. The owner was training someone on how to use the soft serve machine, so I got to take a quick look at the various flavors and food items that Lickety Splits has. I didn't know this, but they have ice cream pies! You can order custom pies with three days notice. Sounds good to me! Lickety Splits has actually gotten a lot better looking. It used to look like a run down white house with an ordering window and a handwritten sign with ice cream flavors on it. Now, the gravel parking lot has been paved, new picnic tables have been put out, white lines have been drawn to make actual parking spaces, and an adorable red and white striped awning has been placed over both windows. There is also a soda machine and several more trash receptacles than I remember. I can really see how Lickety Splits is trying to improve themselves, and it's definitely working. During the summer, you can't get near the place - no matter what the outside looks like. 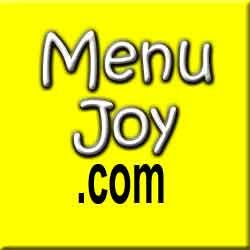 Their ice cream seems to have a lot more flavor than other local soft serves. I don't know what they're doing, but please - keep doing it! Their Oreo is another flavor that is to die for. It's not just flavoring. They actually use real Oreo cookies! The reason why we were getting two pints to take home was because Dad had never tried the peanut butter from Lickety Splits. Mom and I always rave about it, but he's never had a taste. Well, the verdict is in and he thought it was amazing. He's very picky about his ice cream being too sweet, even though ice cream is supposed to be sweet. Dad liked how the flavor was pure rather than manufactured, and of course, Mom and I agreed with him. 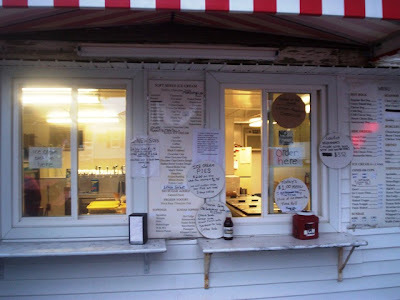 This is by far one of our favorite ice creameries in the area. Lickety Splits also serves food. I've had a hot dog from there that was really good and Mom and I have also had some of their clam cakes. They were a little greasy (the paper bag was almost see-through) but we would try them again. After all, now is the time to support our local businesses! I think we should all get in our cars and drive to Westport right now and order a big bag of clam cakes and a cone of peanut butter. You won't be disappointed. 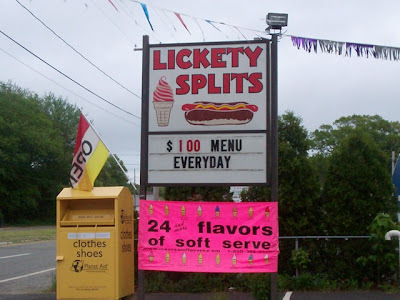 Lickety Splits is open from 11 a.m. to 9 p.m., weather permitting.